Less than two weeks before US sanctions against Iran kick in, OPEC said the oil market could shift toward a surplus and signalled it would adjust output accordingly if that were the case. Saudi OPEC governor Adeeb Al-Aama told Reuters on Thursday the market in the fourth quarter could be approaching “an oversupply situation.” Riyadh is the largest oil exporter in the world and has told the Trump administration it could step up production after sanctions against Iran take effect November 4. “The committee however expressed concerns about rising inventories in recent weeks and also noted looming macro economic uncertainties which may require changing course,” the statement said. 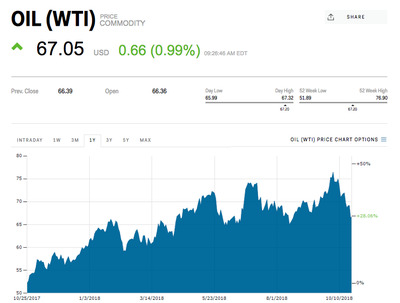 Oil prices rose more than 1% from recent lows after Saudi authorities, in a reversal, said Washington Post journalist Jamal Khashoggi was killed in a planned operation in its Istanbul consulate. Brent is currently trading around $US76 per barrel and West Texas Intermediate at around $US67 a barrel.